Winter can be long and lonely if you're pining away for fresh asparagus, but when it finally arrives, asparagus season is one exciting time. We are able to eat asparagus at least one meal every day from what grows in our garden, but when we get greedy we head out to the edge of our oat field, along a fence line where asparagus has gone wild - escaped from the gardens of the homesteads that have long ago crumbled. Then we all return with fistfuls, pocketfuls, and extras to munch raw as we walk. This simple recipe takes advantage of the only other things I can harvest from my garden - a few green onions, and parsley, which is quick to re-grow from last years stand. Cook Naked & Wild Rice Blend by bringing 3 cups water to a boil in a small pot. Add Rice Blend and simmer until the rice is tender. Fry chicken breasts until fully cooked, and cut into small pieces. Prepare the white sauce by melting the butter in a small pot, and sauteing the garlic for a few minutes. Stir in the flour, and then gradually adding the broth, milk, and cheese until the whole mess is thick and smooth. Assemble the casserole by mixing the cooked rice and cooked chicken with parsley, sage, salt and pepper. Layer on the bottom of a 2 quart dish. 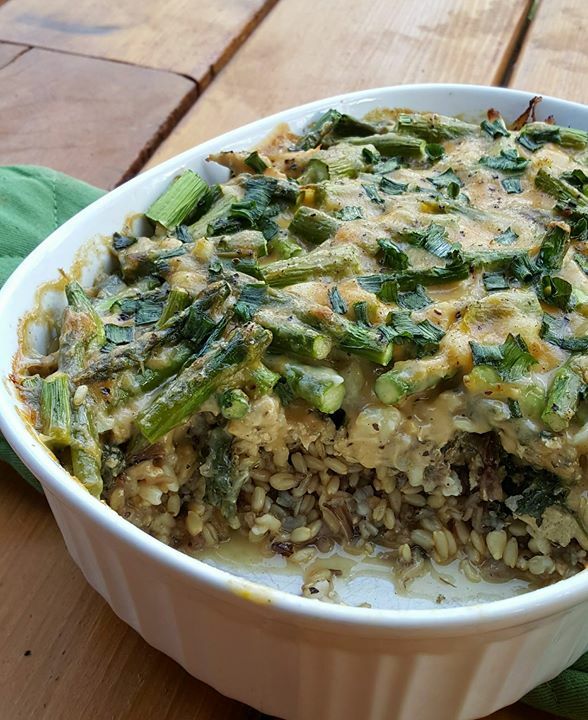 Scatter asparagus on top of the rice mix, top with the white sauce, and toss the green onions on top for extra special-ness.